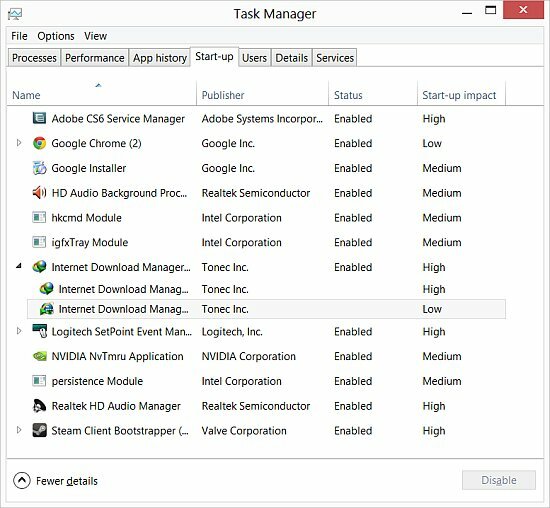 Windows Task manager has come a long way since its introduction in Windows NT almost two decades ago. In its latest incarnation in Windows 8, it’s a lot more than a simple process manager. Microsoft has picked up several handy features that were previously buried inside different Windows utilities, and embedded them in the Task Manager where they will get greater visibility. 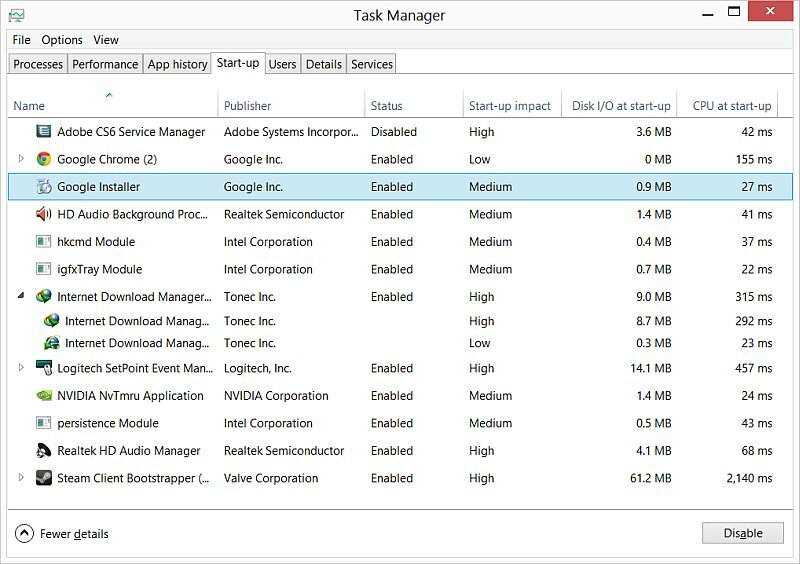 Last week, I wrote about the new ‘Analyze Wait Chain‘ feature in the Windows Task Manager. This week I am going to take a closer look at the newly introduced ‘Start-up’ tab. As the name suggests, the ‘Start-up’ tab can be used to monitor and control processes that automatically launch at boot. In previous versions of Windows, the same functionality was available in the System Configuration (MsConfig) utility. In Windows 8, the ‘Startup’ section of MsConfig utility simply opens up the Task Manager. You can also see exactly how much CPU and disk I/O each process was using at startup by enabling the relevant columns. You can easily disable any process from the right click context menu. Microsoft also helpfully offers to search the web to find more information about processes you can’t identify. What’s surprising about the ‘Search online’ feature is that it uses the default search engine of your default browser, and not Bing on Internet Explorer, as I was expecting. Microsoft has indeed come a long way over the past few years. Without a shade of doubt, the new startup manager is both more accessible and useful. However, to be honest, boot time is going to gradually become a non-issue for most desktop users in a few years. If you have an SSD (Solid State Drive), Windows 8 should boot up in 15 seconds or less. Unfortunately, SSDs are still prohibitively expensive for a vast majority of users, and are still a few years away from becoming mainstream.